Online Language Courses and Lessons Revised Lessons! Maria Oliveira Language Online Courses and Lessons are affordable and effective. Begin your studies today! Our online language lessons bring variety to traditional learning methods and motivate a renewed interest in language learning. As an alternative to a traditional class, online lessons and courses are a preferred tool for learning because of their convenience and flexibility. For example, self-testing questions can be rearranged to make sure true learning is taking place, not just rote memorization. And you can access them anywhere and anytime you choose; they are fun to use, too! Online lessons augment ongoing studies by offering a dynamic page with which to interact. Students in the classroom and independent learners studying at their own pace use online lessons to discover new vocabulary and incorporate additional practice into their schedules. You don't need to be a techie to appreciate our online lessons, either. They are designed for learning, and they are accessible to everybody. You can preview a sample lesson after you choose your target language. 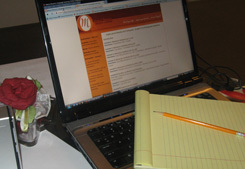 Maria's Online Language Courses are comprehensive and affordable. From beginner to intermediate to advanced levels, there is an online course for you. Online Conversational Spanish Language Lessons and Courses! Online Brazilian Portuguese Lessons and Courses! Online European Portuguese Lessons and Courses! Practice, improve, and perfect your second language skills with online lessons and courses. Completely interactive online lessons. Updated audio lessons compatible with modern browsers. Brazilian Portuguese for Beginners Revised! Brazilian Portuguese 2 - Present Tense Irregular Verbs Revised! Continue to expand your conversational skills and to improve comprehension of Brazilian Portuguese with this engaging and easy to follow Online Course. Practice authentic pronunciation from a native speaker. European Portuguese For Beginners Revised! Learn new vocabulary, listen to grammar overviews and useful phrases in thirty lessons. Study vocabulary for every day situations. Conjugate regular verbs as well as important irregular verbs. Practice and self-test with interactive exercises. European Portuguese Beginning 2A Revised! This online course is a continuation of the Portuguese for Beginners, offering all new vocabulary, grammatical constructions, cultural notes, and readings. Study important verbs and their conjugations, including the preterit of regular and some irregular verbs. Learn interrogative words, impersonal verbs, adjectives, and how to form negative sentences. Thirty-four lessons cover these subjects, and more! European Portuguese Beginning 2B - Present Tense of Irregular Verbs Revised! Build your conversational skills and improve comprehension of European Portuguese with this interactive and easy to follow Online Course. Practice authentic pronunciation from a native speaker. This European Portuguese Course features 30 lessons on irregular verbs in the present. Learn how to conjugate the verbs and use them in sentences. English Course Online for Portuguese Speakers New! Spanish 1A - Beginning Conversational Spanish Revised! Learn basic Spanish vocabulary and grammar and useful phrases in thirty-two lessons. Study numbers, time, dates, seasons, as well as extensive new vocabulary for every day situations. Conjugate regular verbs as well as important irregular verbs. Spanish 1B - Irregular Verbs Revised! Learn the present tense conjugations of 30 new irregular verbs. The lessons include interactive exercises, quizzes, and puzzles. Listen to our audio clips for the correct pronunciation of the Spanish vocabulary, verbs and phrases. You can also purchase our easy to follow and affordable books and media.